It is our prediction that Dartmouth College, ranked second in the 2015 Ivy League Football Preseason Media Poll, will upset Harvard this year and reclaim the Ivy League football title. You heard it here first. It’s that time of year again. It’s time for some Ivy League football action and, for yet another year in a row, we’d like to report on the Ivy League football preseason rankings. And for those of you who are wondering why we write about Ivy League football, know that we write about all things Ivy League-related and it should be noted that the Ivy League was first formed as a football league. That’s right. A football league. Anyhow, Harvard, the defending Ivy League champion, enters the season as the preseason favorite to win it all again, securing 130 points (and 11 first place votes) in the 2015 Ivy League Football Preseason Media Poll. Dartmouth College, a university that has historically had the Ivy League’s strongest football team, found itself in unfamiliar territory of late, landing second in the preseason poll, buoyed by their resurgence last year and fight for the Ivy League crown that lasted through the final week of action. Upstart Dartmouth secured 116 points in the preseason poll, along with four first place votes. Well deserved indeed. Finishing third in this year’s preseason poll is Yale University, with 98 points and one first place vote. Princeton University finished in fourth place with 82 points but no first place votes. Brown University finished in fifth with 80 points and one first place vote. The University of Pennsylvania, which has been a football powerhouse for much of the twenty first century but has fallen off a bit of late, finished in sixth place, with 51 points and no first place votes. Columbia University, which will be led by first-year Lions coach Al Bagnoli (the coach who led Penn through all of those successes) finished seventh in the preseason poll, with 29 points and no first place votes. Cornell University finished in last, with 26 points and no first place votes. We’re excited to see what’s in store for this Ivy League football season. 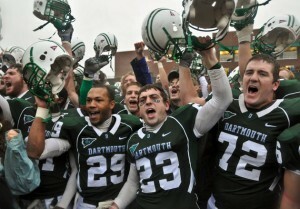 Will Dartmouth College reclaim the Ivy League crown, something that has eluded the College on the Hill for many years? Will Al Bagnoli lead a resurgence for Columbia, a university that claimed the Rose Bowl title in 1934 under the masterful play of our dear friend, and an inspiration for the formation of Ivy Coach over a quarter century ago, Cliff Montgomery? Will Harvard win it all again? We’re pumped to see it all play out on the gridiron. Dartmouth has a shot … we, of course, don’t like Tim’s insistence on games on a week night (at home) and were here rather than there. And we don’t like that you came to Hanover last year and showed us the brown dirt again- for the ninth yr. in a row … that is 9, was it Mr. Wise Guy and 17th of the l a s t 18 was it, you? We do not like you any way and … yuck. Of course the ‘phenom’, so far, is back … and yet was there insufficient just so in 2014 and why should it be any different? I am of the Lambert Trophy (capturing the H. drum) winning yrs., Bob Blackman. And the names in the stats- so many. Gives me some hope. Caldwell, or Vernon Harris, say; McManus- two; Dalyn, Mac Carrier-Folarin Orimolade; Bavaro, Zuttah, Slafsky, Brown and Will Mc. and Victor W. … my man Troy and my man, Kyle and yet there continues, Fulleton-Wickham-Stone-Gakenheimer-Cameron Skaff. Many, many more and might, just might be … such and so many so so many … that overcomes Tim.